The whole theme of this blog is "an unhandy man's attempts to build and sail small wooden boats", so my latest revelation is nothing new, but every time I re-discover this fact, it strikes me with increasing force: boat building is woodworking. And I know so little about it. For example, I've set my heart of building a new set of wooden blocks for the Blue Moon. They look simple, but building a block involves a vast array of skills, from wood working, to choosing the right goops, to intricate rope work. The Mark II block used the same size blank as the Mark I, but I trimmed various bits off to make it smaller. The result was small enough to actually use, and it is currently installed on the Blue Moon as my main sheet block. But, after completing the Mark II block, I knew enough to realize that the blanks I'd been cutting off from the 'master', below, were too big. I hated to throw away the wood and work, but I needed to try something different to get the block I wanted. I also didn't like the maple I'd used to build my first 2 blocks. Call me shallow, but I just didn't like the way they looked. In my mind, blocks should be darker in color, with more pronounced grain. More meaty looking, in other words. In the interim, I'd also built a set of oak cheek blocks. I loved the look of those, so was pretty much fixed on building my next block from oak. Luckily, I picked up a beautiful scrap of white oak at the Wooden Boat Show in Mystic this year. The cost was right -- free -- and I could practically see a complete set of oak blocks and cleats hidden beneath it's rough, grey surface. The shop supervisor, Port (you'll never guess our other cat's name), was skeptical at first, but after I'd planed off the top layer, she was pleased to see the gleaming color and grain of oak. So I had the raw materials for my project. Now I just needed a better design. The cheeks would be thinner. The 3/4" thick cheeks on the Mark I and II blocks were total overkill. The spacers would have the right grain orientation, so the glue joints would be long grain to long grain, instead of long grain to end grain. 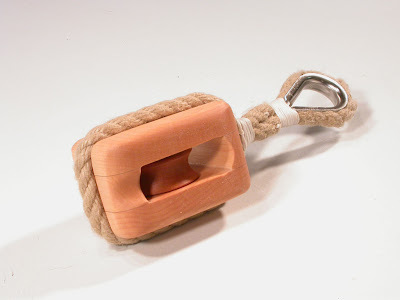 The whole block would be scaled around the size rope I planned to use: 3/8". The sheave would be recessed into the bottom spacer. Re: point #4, I'd had the chance to inspect a number of blocks at Mystic, and discovered one old relic that had an important design feature: the sheave was recessed into the bottom spacer a bit. Not enough to weaken the spacer, but enough to make the block a bit smaller. I liked that idea. I decided not to do too much shaping of the cheeks, as I'd done with the Mark II. All that trimming and smoothing is quite time consuming and I was hoping the new block would be small enough, even if I didn't drastically slice it's corners off. The dotted lines indicate where the spacers are cut away for the sheave (below) and the line (above). If this is hard to visualize, don't worry, there are plenty of pictures coming. I had my oak, my design, and a bit more experience than the last time, so I was ready to go. Have you got a formula for calculating the sheave size? I've been using the guideline for rope set down in "The Complete Rigger's Apprentice": 4 to 6 times the rope's diameter. 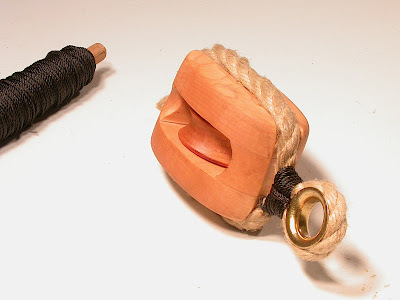 Thus, for the 3/8" rope I use for outhaul and reefing tackle, the sheave (or shiv) should be from 1 1/2" to 2 1/4" in diameter. Since wooden sheaves have more rolling resistance than plastic ones with high-tech bearings, I went on the high side. 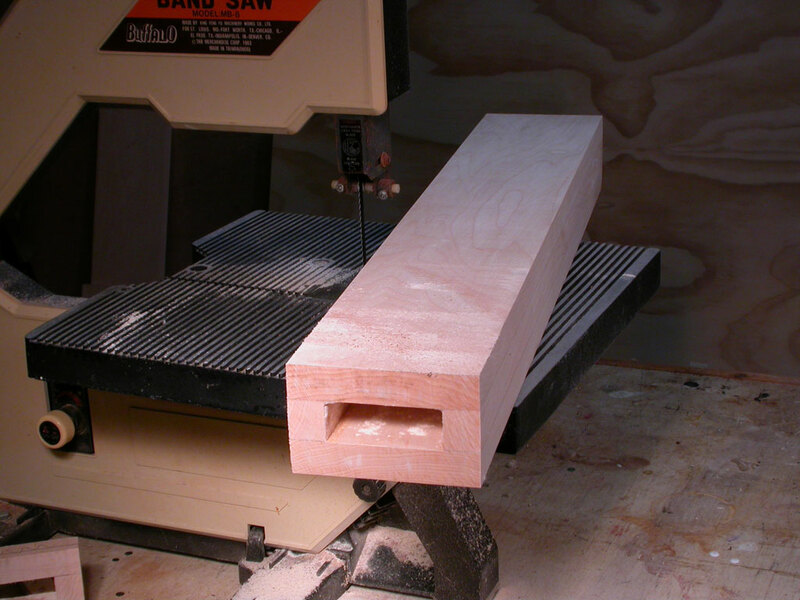 I use a 2 1/4" hole cutter to cut out the blank. Of course, that's the *outside* diameter of the cutter, and I'm interested in the *inside* diameter, so I end up with about a 2" sheave. If I was building blocks for a 6:1 tackle, I might consider using more slippery sheaves. I've got The Rigger's Apprentice so I'll look that up. You're building a great resource here. Much appreciated.